The Archer Ikon is an ideal adjunct to a good valve amp. Great value, build and tones. Tiny screws if you want to change a battery. If we asked you to name two items of guitar gear that have a massive reputation among tone-fiends but are now out of production and so rare that used prices have escalated to the point where they are out of reach of even the most wealthy, chances are that the original gold Klon Centaur pedal and the Dumble Overdrive Special amp would be mentioned. Original Klons go for silly money compared with most pedals, and if you could find a Dumble amp on the market... well, you could buy a decent terraced house in certain parts of our fair isle for the same money. Indeed, Alexander 'Howard' Dumble only made around 300 of these amps and is unlikely to make any more, while Klon designer, Bill Finnegan, has said he will never make any more Centaurs. Not surprisingly, then, plenty of stompbox companies now build pedals that aim to get you close to those elusive tones, not least J Rockett Audio Designs (JRAD) whose new Tour Series pedals, the Archer Ikon and The Dude, respectively promise Klon and Dumble-alike tones. Both are nicely compact and reassuringly heavy pedals that take a nine-volt adaptor, but will also run off batteries, although the four screws for battery access are small so you'll have to be careful with them. Today we're looking at the Archer Ikon. When Bill Finnegan decided that he wasn't going to make any more Klon Centaurs, he enlisted the services of JRAD to undertake production of the follow-up KTR pedal. 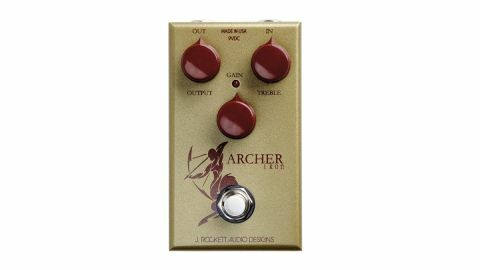 Ultimately, the deal fell through, but JRAD consequently produced a Klon clone called the Archer. We've featured the silver version of the Archer before but now the company has released this gold version called the Archer Ikon (cough). It's not just that colour scheme that recalls the original Klon, though; this version apparently has the same 'magic' diodes. Although Klon Centaur circuit boards were covered in gloop to disguise the components used, word got out about what the circuit was - all except for a pair of diodes that were not incontrovertibly identified. Consequently, the many Klon clones that are around use different value diodes. However, US retailer Pro Guitar Shop and JRAD now claim to have identified and acquired some of the 'magic' diodes and developed the Archer Ikon around them as a 100 per cent, part-for- part remake, fine-tuning the circuit along the way to be indistinguishable from an original gold Klon. Rockett's take on the Ikon is that it has a tad more compression in the midrange, plus less high-end presence than the silver version, which would translate to being smoother with a little less bite. We didn't have a silver version on hand to compare it to, and are aware anyway that any differences would be subtle and translated by each player in their own terms. What we can say, though, is that it does exactly what you would expect a Klon-style pedal to do. With the gain down and the output up you get a lovely open-sounding boost for your amp - something to kick in or to leave on all the time, with a treble knob fine tuning it to taste. Turning up the Gain knob dials in nicely smooth and transparent low-level overdrive that should complement any amp.